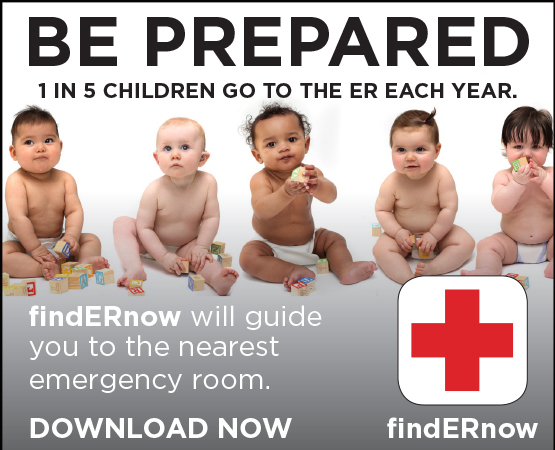 Quickly find the closest ERs and see which are more likely to be prepared for your child. R Baby has teamed up with the experts at EMNet at Massachusetts General Hospital to fund the pediatric version of the app, findERnow. 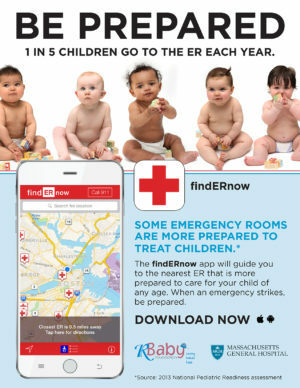 The app will now include pediatric information to help parents and caregivers find the closest ER more likely to be prepared for their child. According to the Emergency Medical Services for Children (EMSC)’s 2013 National Pediatric Readiness assessment, only 47% of the 4,146 ERs surveyed nationwide have an emergency preparedness plan in place that addresses the unique needs of children. ERs have different levels of preparedness for pediatric emergencies due to varying degrees of training and equipment. Please visit your phone app store and download this essential app now!